As a follow-up to yesterday’s brief bit on the Parker Space Probe, I thought it was worth taking some time to share more information about the project. This is some of the best we have going on in the scientific community (in my not so humble opinion), and I thought it was worth learning and teaching more about it. Watch live in the embedded video above, or read on for more details than you ever realized you needed. The Parker Space Probe launch window opened this morning around 3:30 Eastern Time and extends to August 23rd. So depending on the weather at Cape Canaveral (Space Launch Complex 37, more specifically), the probe may already be on the way to the sun by the time you read this (I’m writing it a day before launch but posting around 7 hours post possible launch time). While reading the Engadget article referenced yesterday, one of the first things I wondered was just how the probe would withstand the heat from the sun. We’re talking around 1400° Celsius (2500° Fahrenheit for those that don’t grok metric) when hitting the probe’s 6.16 kilometer (3.83 million mile) solar orbit target. That’s well within Mercury’s average orbit (45.9 million km or 28.5 million miles), leading to temps around 800° C hotter. As noted in the above video, there are several things at play protecting the probe. If you skipped the videos embedded above, here’s a rundown of some of these features (linked to the appropriate spot in video for confirmation) keeping the probe functioning on its mission. Intelligence – Autonomy software which controls the facing of the heat shield relative to the sun. Sensors behind the heat shield shadow adjust the probe when any of them are exposed to the light/heat of the sun. Cooling System – A water cooling system protects the solar arrays much the same way the cooling system in your car protects the engine. Heat is not Temperature – This is more reasonable than it may appear at first glance; when you reach into a 400° F oven, your hand isn’t 400° F as well. The Parker Space Probe will be launched via Delta IV-Heavy rocket. The Delta IV is an expendable launch system designed by Boeing. It is a 4-rocket vehicle made up of basically a Delta IV-Medium+ rocket with 2 boosters replaced by 2 more powerful core rockets. 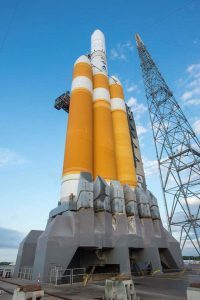 While now surpassed by SpaceX‘s Falcon Heavy rocket, the Delta IV-Heavy rocket is still a workhorse part of the US space program. There are plenty of reasons to study the sun, and plenty of obstacles to our getting there. For one thing, consider that this is our first visit to a star of any type. While the Parker Space Probe will be flying through space at an impressive 430,000 miles per hour, that’s only 120 miles per second. Considering our next nearest star, Alpha Centauri, is 4.37 Light Years away, we’re looking at somewhere around 7,000 years to get there using current technology. We’ll not be studying any star but the sun for some time. For another, considering that even if we can get a probe to Alpha Centauri any time soon, it will take 4.37 years for a response to come back. As for obstacles to getting to the sun, there is the aforementioned heat issue, and there is the complexity of getting the probe to the right place at the right time with the right orientation and the right amount of fuel to maintain position and proximity. Beyond those issues, there are the very real challenges of space flight as covered in this Wired article which discusses Mars-oriented travel plans – problems like slow spacecraft when compared to the distances involved in space travel and avoiding damage while leaving earth orbit. To wrap up this too brief yet still too long briefing on the Parker Space Probe, this is one of the biggest space-related topics we have to discuss for the near future. It’s certainly the biggest project that I have knowledge of until the James Webb space telescope launches in a few years, and thus one of the most exciting NASA missions occurring in the next few years. For continuity’s sake, I’ll have a similarly lengthy write-up on the Webb telescope before long. It’s a fascinating topic as well. Please comment with your thoughts on the launch down below. I’d love to hear what you noticed or thought about during the Parker Space Probe mission.